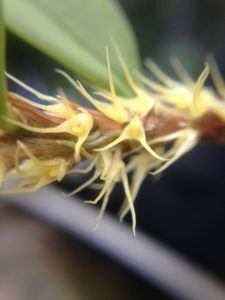 The Genus Bulbophyllum includes plants with a very wide range of growth and flowering habits. One of the more unusual is Bulbophyllum clandestinum and when we first saw this plant in the wild in Laos it took us a while to be sure it was an orchid species. 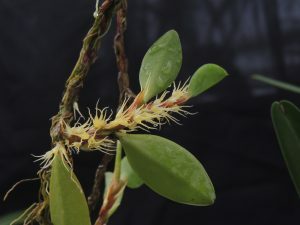 It grows along a long pendulous rhizome and appears to produse thick alternate leaves along this rhizome like many non orchid climbing epiphytes. The clue to it being an orchid when not in flower are the tiny pseudobulbs at the base of each leaf and the distinct orchid roots that wind their way along the rhizome. Fortunately in Laos we found evidence of flowers too and although these are small they clearly belong to an orchid. This Bulbophyllum is found across South East Asia and Malaysia and produces tiny yellow flowers along its rhizome between the pseudobulbs. In Laos the plants were growing in low light at 1000m altitude and so we grow the plant mounted but hanging low and shaded in our Warm Asia section. Why not add an orchid with an unusual growth habit to your collection this year? Please would you remind me of the name of the interesting upside-down orchid and where it came from. Also the orchids you said that the Victorians liked because they survived the coal fired ranges what were they called.